Back for 2017 – the Noah’s Ark Charity Dangle. 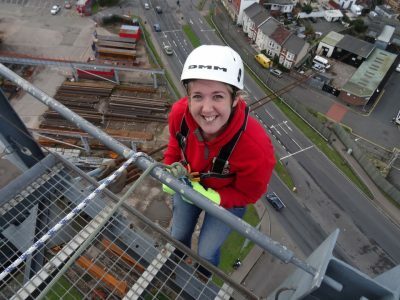 Sign up for a 178 foot abseil from the historic Newport Transport Bridge for a registration fee of £15. Climb the 278 stairs to the top then steady your nerves by taking in the fantastic vista before taking the plunge. Registration include a free t-shirt. We kindly ask that you commit to raising a minimum of £200 for the Noah’s Ark Children’s Hospital Charity. Participants between 14 and 18 must have consent from a parent or guardian. Weight restrictions: Max weight:127K (20 stone) – Minimum: 20K (3.15 stone).